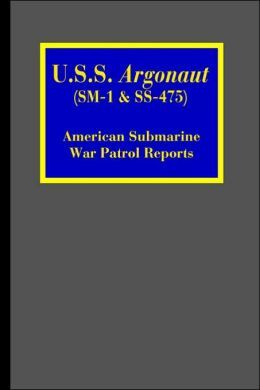 During World War II, the United States Navy employed two submarines named Argonaut on operations. The first was a giant mine layer, designated SM-1. Built in the 1920s, the first Argonaut made three war patrols, the first, off Midway, having started as a peacetime defensive patrol before commencement of hostilities on 7 December 1941. The full reports of her first two patrols are included. Because she was lost with all hands during her third patrol, no official report exists. A short article is included covering what is know of this patrol, along with a full list of all those lost. The second Argonaut (SS-475) was a Tench class fleet type submarine, built by the Portsmouth Navy Yard and commissioned in 1945. She made only one war patrol before the Japanese surrender brought the war to an end. The official report of that patrol is also contained in this volume. The second Argonaut survived into the 1970s, spending her final years in Canadian service as HMCS Rainbow. The naval flirtation with cruiser submarines began in World War I, but came to full bloom during the inter-war period. The concept was a simple one, rooted in the long-standing practice of guerre de course, or commerce raiding. While the Admiralties of the various maritime nations, enamored of Mahan’s theories on the “decisive battle,” built up fleets of huge battleships, battle cruisers, and other heavy combatant ships, other officers had recognized a different truth. While major fleet engagements might, as Mahan opined, be decisive in terms of destroying the enemy’s naval offensive power, they might not have quite so significant an effect on the war as some believed. Trafalagar might very well have been decisive in the naval arena, but Napoleon was not, it should be pointed out, completely and finally defeated for another ten years. Of equal, or greater importance was the practice of blockading an enemy’s ports, and then determinedly hunting down and capturing or destroying any merchant ships that made it through the blockade. One only had to look back as far as the American Civil War to see the value of an effective blockade in depriving the enemy of vital raw materials, finished goods, and markets for manufactures. One could also look to the same war to see the effectiveness of commerce raiding, where a single Confederate cruiser could devastate Union trade, and tie up whole fleets in hunting her down. The Civil War also demonstrated, for the first time, the military utility of the submarine when the H.L. Hunley attacked and sank the union blockader U.S.S. Housatonic. Hunley was lost on the same night, the cause remaining unknown to this day, but her attack was a clear success.